•The main (server) computer "crashed" and the program needs to be completely reinstalled. •Desire to move Frazer to another computer that may have a newer operating system or is located in a more convenient place. How do I get a backup? In a vast majority of cases, receiving a backup will require calling Frazer at 888-963-5369. 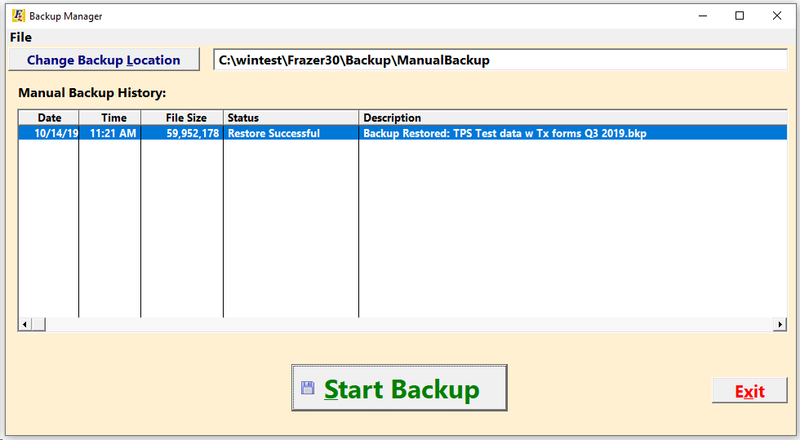 If you have access to your main computer you can also retrieve a backup from the "ManualBackup" folder in your Frazer30 folder. When you call in, we may ask you some security questions to verify you are who you say you are. In addition to compliance issues when handling data, this protects both your dealership's data as well as the personal information of all of your customers. We don't want your data in a bad guy's hands! Make sure all users on all computers in the network have exited Frazer. To restore the backup file, click on on the desktop. If the program is not on your desktop, then you'll need to navigate to the Frazer30 folder on your "C:/" drive and look for "Frazback.exe". Once you're in the program, click on "File" then "Restore Data". Check the understanding box and click on . Choose the backup file from the location in which it is saved. Click on . The Backup Manager will display messages indicating if the restore was successful or incomplete.